No, I’m not referring to Nirupa Roy, Farida Jalal or Reema Lagoo. I’m talking about the top heroines of 80s and 90s who are now keeping themselves busy by promoting junk foods for children. Turn on the TV and you’ll see them in food related channels like FoodFood and kids’ targeted channels like Pogo and Cartoon Network - running behind an active child and feeding them some junk or the other. I’m sure there will be a counter-argument that viewers need to be responsible and well informed before they make a purchase decision and not blindly go with the celebrity endorsements. How about an epilogue at the end of each ad? 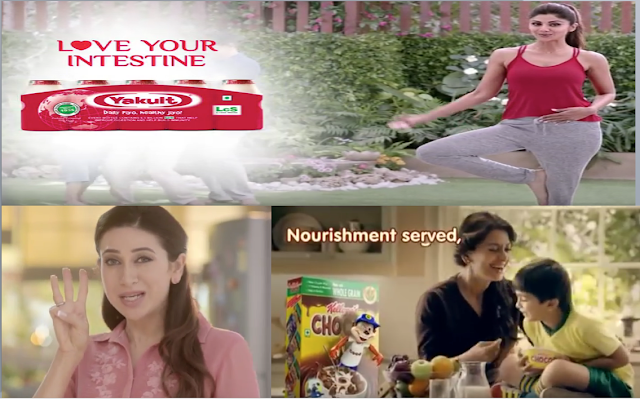 Bollywood moms, we would rather remember you for your fine performances in movies in 80s and 90s, than in such junk food promoting ads. I admire Twinkle Khanna for pursuing her writing skills, post her short stint in Bollywood. I haven’t read her books yet but her columns are outright funny and witty. It would be great if other Bollywood moms take inspiration from her and pursue something else other than promoting junk foods. Anyway, an article I came across recently gave me some relief and I’m hoping atleast some of the recommendations see the light of the day. Apparently, a 11-member FSSAI panel has come up with a report on "Consumption of Fat, Sugar and Salt (FSS) and its health effects on Indian population”.